Four test subjects participate in a shadowy medical experiment with deadly results. William Hunter, Jake Butler, Samantha Foxx, and Dominic Black are briefed on the medical experiment that they are about to undergo. The four participants sign the release papers and become the Gentek B15 test group for an experimental medication. B15/Day One – Dominic is the first to wake from the experiment and is asked a series of questions by Le Roux, the remote test administrator. Armed guards transport the four participants to another room. One of the guards hits William in the face when the subjects resist their transport. The guards then leave the group alone. Dominic puts on the glasses he finds in his pocket. Samantha finds her asthma inhaler. Jake puts on his watch and realizes that the group has been out for two months. William looks for a way to leave. Dominic reveals that he no longer needs his wheelchair. Jake notices that the scar is gone from his brain tumor. William no longer has his neck tattoo and Samantha no longer has any piercings. Colin Norton, an infected survivor from group B14, is seen wandering the halls. William finds a fire axe. Group B15 tries to puzzle out their scenario. Dominic realizes that they still have their genetic defects, but things that they did to themselves have been cured. Night cameras show another survivor from group B14. B15/Day Two – Because he is sweating, the group thinks Dominic is hiding water. William wonders if Dominic is really a Gentek agent. The group wonders the same about William. A Gentek agent, De La Rossa, is attacked by an infected anomaly. B15/Day Three – Agents Reece and Briggs are dispatched to recover Colin Norton and Megan Donovan, the two B14 anomalies. Megan Donovan is pregnant and is to be recovered unharmed. Norton can be killed onsite. De La Rossa is now infected. Dominic starts bleeding from the mouth. Briggs breaks protocol and searches alone on the top floor of the facility. William, Jake, and Samantha find De La Rossa and are chased. Briggs shoots the infected De La Rossa off of Samantha when it pounces on her. De La Rossa attacks Briggs. Dominic begins to succumb to the infection. Group B15 barricades themselves in a room as their internal conflict grows. Reece recovers Megan. Reece hands Megan a gun before being attacked by the infected Briggs. Megan shoots Briggs off of Reece, but Briggs is not killed. William takes Megan and Reece hostage and begins torturing them for answers using electric wire shocks. Jake and Samantha confront William, but Jake is unable to shoot him. During the distraction, Reece stabs William to death. Megan explains that test subjects begin rotting until they turn insane. B15/Day Four – Megan wheels William’s body to the morgue and uses the axe to cut off his arm. Megan drains the blood from the arm into a bag. It is revealed that she has a host of blood bags tied to her stomach. Now infected, Dominic chases the group as they follow Reece towards an exit. The other infected chase them as well, separating Reece and Megan into one pair and Jake and Samantha into another. Reece hides Megan in the morgue. Reece is later attacked by an infected and killed. Jake and Samantha make it outside after fighting off infected, but are pursued by armed Gentek agents. A voice tells Le Roux that they have the group’s DNA and can repeat the experiment. The soldiers then execute Jake and Samantha. Agents retrieve Megan from the morgue. They take a blood sample from what they believe to be her stomach. Agents also retrieve Dominic’s corpse. Clones of Dominic are revealed to be the constant in all of the experiments. The B group subjects were actually all clones. The experiments try to uncover why they are expiring. While drafting the opening paragraph of this review, a sense of déjà vu descended that had me checking my own archives of previous film reviews. Sure enough, the topic started with here was already covered in my review of “State of Emergency.” Fitting then, that the two reviews share a theme. “State of Emergency” and “Expiration” are kindred spirits of a sort, and would make for apt companions on a double feature bill. And though several of the tangents were noted in “State of Emergency,” they bear repeating in a review of “Expiration,” even if it flirts with self-plagiarism. Zombies continue to be a seemingly unending commercial cash cow in contemporary popular culture. But using zombie angles as a marketing tool is a double-edged sword that cuts deeply both ways. On one side of the blade, sales are likely to spike and a movie will increase its presence thanks to the undead fanatics that eagerly lap up any foray into the sub-genre. Slicing the other way, those same fans are liable to turn into a bloodthirsty horde of their own when the product does not quite match the description. 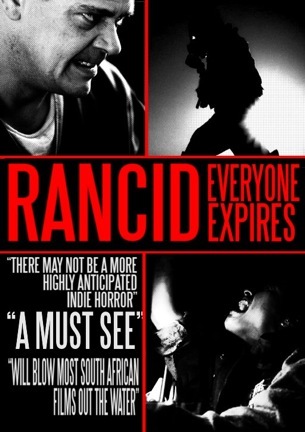 Press for “Expiration” has used the term “zombie.” The movie itself even uses the word as part of one character’s dialogue, although the character in question speaks abstractly as opposed to literally. While the term is not completely unwarranted, it does “Expiration” a disservice by creating a certain prospect around the style of thrills it has in store. Going into a viewing of “Expiration” looking for a zombie thriller will find that expectation ill met, as this film is something much more subdued. Four people have willingly signed themselves up for a lucrative medical experiment. The good news is that the drug being tested cures cancer, corrects spinal injuries, and even removes tattoos, all from one simple pill. The bad news is that its side effects give the test subjects an expiration date. When that expiration date arrives, which does not take very long, an infection takes over and the subject becomes mindlessly desiring of blood and carnage. Despite the similarity in the way the infected are depicted, this scenario has more in common with thoughtful thrillers like “Exam” and “Fermat’s Room” than it does with “28 Days Later.” Although not on the same level as “Exam” or “Fermat’s Room” with the complexities of its plot or the intelligence in execution, “Expiration” is about four people who awaken in a strange environment and need to quickly puzzle out their circumstance if they are to survive. The characters are cookie-cutter. There is the arrogant loudmouth, the quiet pacifist, the brain, and a somewhat nondescript female. But this being a medical experiment, it makes some sense that the test subjects would fit different typecasts to achieve a specific range of results. Although they are integral to the story, the number of infected shown in the film can be counted on one hand, which is why expectations of mass zombie madness should be expelled. There is still some menace in the low number, however. Confronting a slow moving pack comprised of dozens of undead corpses is perhaps less frightening than being caught in a mazelike building with one nimble and vicious creature that could pounce from any shadow at any time. These monsters do not announce their presence until it is too late, and they may be waiting around any corner. Again, the infected in “Expiration” are an element, and not the focus. The true focus is the mystery of what the experiment actually is and why events transpire in the way that they do. Those questions are answered, though it is possible that by the time the revelations appear, the viewer will already have formed an opinion on the film’s quality. Patience for the slow drips of information and tolerance for repetitive scenes of shambling shapes in hallways are required for total immersion, but the payoff is there for those willing to invest their attention. Aside from questionable classification in the zombie sub-genre, “Expiration” is reminiscent of the similarly budgeted “State of Emergency” in its look. “Expiration” hides the amount spent on the production with a high contrast visual appearance focused on quick cuts in a handheld style. The bleakness depicted works well for the dilapidated building and lab environment settings. It is a simply staged film with a compact number of characters in one location, yet done so for the sake of the story, and not because of a limit imposed by the wallet. “Expiration” occupies a middle ground in suspense and horror, though it leans further into the positive than into the negative. It is a film limited intentionally by its scope and unintentionally by its budget. It is not a fast-paced zombie horror film. It is a small and condensed drama centered on panicked people grasping for a handle on their predicament. Like the test subjects putting their John Hancocks on the release forms, be sure to know what you are signing up for before your name goes on the dotted line. April 18, 2013 by Ian Sedensky.